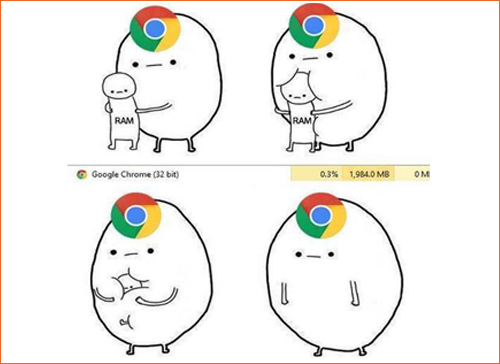 Google Chrome is a Greedy RAM Hog. Here's How to Fix It. Most laptops don’t come with a huge amount of RAM; once the allotted memory is full, the computer can’t process any more actions. Each new tab that is opened in the browser will consume more RAM. In Chrome, 15 tabs can range from 1 GB to 2 GB of memory used, depending on the media content. Take a look at how much memory your Chrome tabs and extensions by copying chrome://memory-redirect/ in your browser. After doing a few tests with the same 15 tabs open in Mozilla Firefox, memory usage is 35 to 45% lower. Firefox appears to be a far more lightweight browser, a drastic improvement over older versions. If you don’t want to switch from Chrome, try downloading one of the following Chrome extensions to help reduce memory usage. I would recommend downloading only one, as more extensions will use more RAM. Reducing the number of open tabs saves RAM. With the OneTab extension it doesn’t matter how many tabs you have open because OneTab converts all your open tabs into a single list, so those open tabs are merged into a single tab. Depending on how many scripts are running inside your tabs, moving them to OneTab can also speed up your computer by reducing the CPU load. OneTab advertises saving up to 95% memory in Google Chrome; when I tested it, I didn’t get that good of a result, but still saved over 600 MBs of RAM with 15 tabs open. The Great Suspender: Download for free. Tab Hibernation: Download for free. 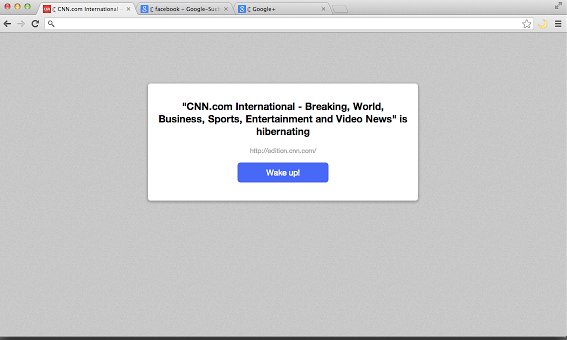 Tab Hibernation does one thing and does it well: sends your tabs to sleep. It hibernates all tabs except the active tab. Your tabs won’t get lost and you can restore them with a single mouse click. It’s not as versatile as Great Suspender, but it’s less buggy. Those are the extensions I tried out, and they all worked well in cutting down on memory usage. Let’s hope the next version of Chrome will be more lightweight and not so RAM greedy. Jared Smith is HostDime’s Content Strategist. Add him on LinkedIn. I was about to install Great Suspender because I like seeing all my tabs and not a list of them in some sort of shortcut view. Then I read this “It’s not as versatile as Great Suspender, but it’s less buggy.” Oh’, it’s buggy? In what way? I am curious, of these three options which do you actually prefer? If GS is buggy, do you mind sharing what you experienced that might make me think twice about installing it? Thanks! 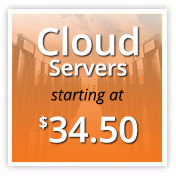 Hey Mark, thanks for checking out the HostDime Blog! The Great Suspender does a lot of things, and for the most part it works as advertised. If you read the app reviews, you will see that people are having problems with “whitelisting” certain websites, and having their tabs disappear once in sleep mode. I did not experience any of these problems in the two days since downloading the extesion. 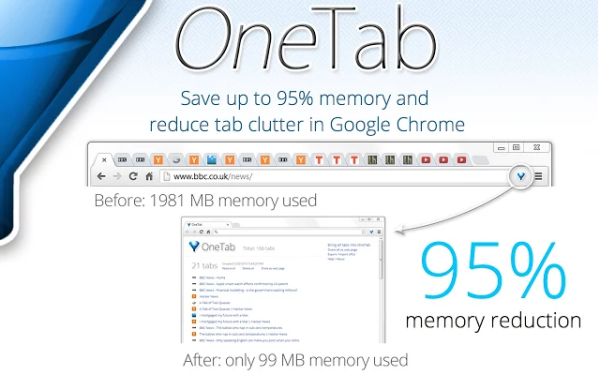 If you don’t mind all your tabs in one tab, go with the OneTab extension. If you want to keep most of the tabs suspended, The Great Suspender should work just fine. Come on back and let us know which you chose and how it works for you! Thanks Jared. I uninstalled The Great Suspender. 🙂 Same issue as you mentioned, whitelisted tabs still suspend. Plus I have Chrome logged in with my Google account so my extensions are the same on both my home and work PC. Those settings don’t copy over though and would have to be reset on each computer. A small annoyance but one nonetheless. I am going to try OneTab. I have 8GB of RAM, but Chrome looks to eat up memory real quickly. It starts to become unstable as soon as it crosses 3GB for some reason with only two tabs open. It leaks memory and fails to close processes when close it. I have had this issue since Chrome 20. I try to close background apps and avoid installing any extensions. But I cannot get it to work smoothly at all. Flash is another horrid inclusion that breaks Chrome too many times on my PC. Really unhappy with it on my X200. No issues with Firefox. Tried Opera Next to check if it was Webkit/Blink. Same memory consumption which is much more than FF and IE. Stability is about the same. Will wait for more optimization on the engine and install it in a few months again. OneTab permissions list says it can “read and change all the data on the websites you visit”.. This is why I prefer SessionBuddy over OneTab. It’s not as easy but it doesn’t ask for this permission. Besides being a huge memory hog, most extentions don’t work or the reviews warn of them being filled with malwhere Eeek! No thanks. Is your comment a generalization of various extensions or specific to the ones mentioned on this blog post? If what you said was even partially true, security experts everywhere would have a field day with Google and their web store and it would be shut down or at least heavily scrutinized. I use several extensions that all work perfectly fine and have zero malware. Eeek! I am an expert and I testify that it is true. Google only monitors whether an extension violates their YouTube TOS. Yet, I have consistently ran into extension after extension on the store that contains malware. And guess what Google says when notified. NOTHING! Google doesn’t care. The software remains on the store. Some for over 3 years since they were first put up and continue. It is true. This page is showing as light gray text and is very hard to read – What ? Its supposed to be readable – dark text on a light background – CONTRAST !!! Actually every time you open a new tab it consumes a certain amount of computer memory. A single Chrome tab can use between 20 MB and 100 MB of RAM.The more you open tabs the more it will slows down your browsing speed.You even find it tough to surf through different tabs. The Great suspender is a light weight chrome extension that reduces chrome’s memory foot print for users and thus helps you to work with multiple tabs without any trouble. 2.You can access each and every tab at any instant of time without any crash of the browser. 3. 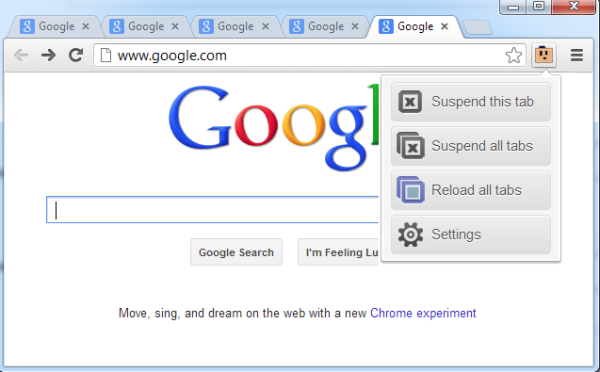 It automatically suspends some tabs in order to avoid Browser Slow down or Crash. 4.The Great Suspender Extension facilitates you to suspend particular tabs manually after a certain period of time or else you can view them in your tab bar. 5. the tabs are not suspended forever, You can restore suspended tabs just by clicking anywhere on the page. 6..Keeps history of suspended tabs. 9. It has an additional feature , that is you can put desired sites like – Facebook, twitter, Gmail etc to a WHITE-LIST which will protect this sites from getting suspended. to know about more extensions that helps in memory and tab management. There are lots of tab managers available in google find their pros and cons through this blog. i got problems with chrome and tumblr …. usual things tha A LOT of users have …google search doesnt help fix the problem as always many retards psot addons extensions sripts fantasy solution that may free up memory by closing the tabs!! !LOOK HERE if i wanted to close the tabs i can do it its simple logic close it and reopen it!!! i want the browser to auto save or free memory without reloading or closing any tabs u idiots!! tumblr more specifically should release its memory for posts that are passed/scrolled down/up … simple logic says that when tyoo much ram close it and reopen it i DONT WANT TO close it!! most people say “oh use shift+esc and purge the tab that uses the most memory” what am saying ARE U STUPID!? that action just closes down the page it doesnt do anything else!! how to describe it i dont know its the most retard thing /solution/fix i have ever read in my damn life!! i got same problems with firefox and facebook …after 2-3 mins or browseing firefox crashes…chrome doesnt crash but hangs the whole pages and processes for some seconds and then continues.some times just crashes the page only not the whole browser! i searched everything NOTHING works and noone is giving a solution even if its small every comments on their damn stupid ideas of closing it and reopening it!!! NO THATS NOT A SOLUTION!!!! my solution…bare with ur nerves and crappy browsers of multymillion companies that give 0 f*cks about simple but so important matters…. He has very valid points. I have complained incessantly about similar failures of simple logic in programming design decisions by major players. George, you are right. They are all raving IDIOTS! The programmers… egoistic A-wholes (purposely misspelled) who think they can do anything as well as any professional in that OTHER field… like design, or business, or just rattle off anything and you will be correct that programmers think they can do it. And when they try it turns out crap! And they blame other people or the wind or the weather. IDIOTS! I have 50+ years in programming and they are right. Before we had little to work with and to program with optimization as a key in all areas.., Mem, Storage, Loop iteration and timing. The current day programmers are a bit sloppy. They program on the best hardware, whereas we purposely alpha tested on the worst hardware for better than real world testing. I started when programs were boxes of indexed punch cards. A lot of thought went into every byte…. The OneTab page makes a great “to be read” list, organized by date saved. Ever since I installed AdBlock on my router (running custom firmware), so that all devices in my house share the benefits of an ad-free experience, Chrome has been far more manageable. For example, I have 4 browser windows open right now with about 15-25 tabs in each one (I use browser windows as “contexts” for projects). Here at work, with no AdBlock, chrome is using 12 GB of RAM on macOS (obviously a lot is disk swap). I know from experience that if I 1) close Chrome (CMD-Q), 2) connect to my home VPN, which has AdBlock enabled to tunnel all traffic through it, and 3) re-open chrome and use it,Chrome’s RAM usage drops to around 5-7 GB after about an hour of use with all of these windows and tabs. I do this a lot when I have to start up a few dozen docker containers and a few are memory hogs with databases. There are more than one Jared Smith in Linkedin. I have sent request to one. I am on mobile phone and my issue is with Google Apps Interactor. I use great suspender. I have 6GB of ram and chome used around 1GB to 1,4GB. Now it only uses 500MB to 700MB. It is easy to use too and i did’t have any issues as well. I have 16gb of ram in my PC and chrome eats up HALF of it with only ten tabs!